The Giving Through Youth program began in 2015 in order to encourage community service and philanthropy among young people by engaging them in decision-making on the distribution of grant dollars. In the last four years, thanks to the dedicated efforts of students and teachers in three schools in West Marin, as well as the generosity of community members, $28,875 was awarded in 44 grants to 29 nonprofit organizations for a range of interesting initiatives. These include improving a sandbox at a local children’s center, providing headphones for young people involved in a local radio station, supporting senior lunches, and building a fence to protect community land. 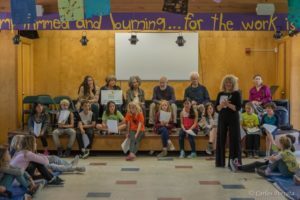 West Marin Fund grants $2,000-3,000 to participating classrooms for them to re-grant to local nonprofits of the students’ choosing. To make their decisions, students research community needs, read nonprofit websites, meet the nonprofit leaders, identify what activities are needed, and learn how much they will cost, all with the guidance of their teachers. The students then write persuasive essays, deliberate amongst themselves, and come together in their schools for presentations and discussions with their selected grant recipients, West Marin Fund donors, staff, and the Giving Through Youth Steering Committee. The students are engaged and articulate about what they learn and the significance of their efforts to benefit others. They carry these important lessons with them as they go on to high school to continue their formal education while becoming conscientious and thoughtful citizens. Please contact Sarah Hobson to learn how you can support West Marin’s next generation of philanthropists.